Steps to replace lawn by seeding or sodding. Blog / Lawns / Lawn Replacement: More Lawn or Something New? Lawn Replacement: More Lawn or Something New? You can see your lawn is beyond renovating, but what to do about it? Once you’ve killed off the struggling grasses and the rampant weeds, your choices are to start over with a new lawn or to replace it with one of many alternatives. First, assess the area where you had your lawn. Be realistic about where you can expect grass to grow. Eliminate those areas that are too shady, too wet or dry, or too steep and concentrate on what remains. Next, think about what purpose(s) your lawn space serves. Do you need a recreation area for sports, a play area for children, or space for your pets to roam? Does your homeowner’s association require you to have a lawn? Finally, do you like the look of a lawn and enjoy maintaining it—or don’t mind paying someone to do so? If yes, you’re ready to start over and do your lawn right this time! If not, go back to the reasons you have a lawn and consider ways to achieve your goals with little or no lawn. Consider keeping a lawn only in those areas where you really want or must have one. 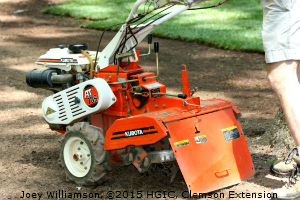 Instead of lawn, consider mulched soil, areas planted with groundcovers, or paved surfaces. Increasing impervious surfaces can cause stormwater management problems, though, so consider using gravel or other permeable materials where practical. New lawn: seed or sod? Now is the time to plant cool season fescues and Kentucky bluegrass, but you have a choice of seed or sod. If you choose to seed, study the seed bag label and buy certified seed. Cheap seed mixes may have less desirable grass varieties and some percentage of noxious weeds. 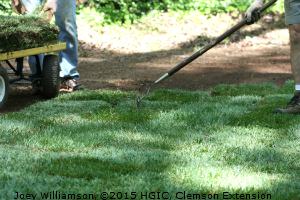 You can find tall fescue and fescue/bluegrass sod grown in North Carolina from several sources. Check that your sod is certified, too. Whether you seed or sod, you will need to prepare your soil. Once you have killed off your grass and weeds and have your soil test results, remove any obvious debris, and work your starter fertilizer and lime into the top six to eight inches of the soil surface. This is one of the few situations where rototilling is useful! Rake the surface smooth before seeding or sodding. Use a lawn spreader to apply your seed evenly to your prepared soil surface and then gently rake to cover the seed just barely. Mulch lightly with a weed-free hay or straw and keep the soil watered to a depth of at least 1.5 inches, being careful not to wash the seed away! This may require watering more than once a day to keep the seeds moist enough to sprout. As the grass begins growing, water less frequently, but more deeply. Let your plants reach about 4.5 inches before you mow to 3 inches. Fertilize your lawn again about six to eight weeks after it sprouts, using your lawn spreader. Lay sod in brick-like pattern. Be sure your prepared soil is well-watered, but not muddy. You may want to seek professional advice about how to estimate the amount of sod you’ll need and consider having a professional install it. Time your sod delivery so you can lay it within 24 hours and keep it in the shade so it doesn’t dry out. Start laying sod from a straight edge, using a brick-like pattern. You may need to stake the sod to keep it from slipping. Always lay strips lengthwise, or across the slope, even on gentle slopes. Use a lawn roller to ensure good contact with the soil and then water. Now that you know what it takes, maybe you’ll consider planting trees, shrubs, perennials, annuals, vegetables, and herbs instead of lawn! University of Delaware Extension personnel call lawns “turf grass madness” and make a strong case against them as high maintenance, water-using, polluting, and of low wildlife value. Some increasingly popular alternatives are edible landscaping, moss lawns, and pollinator gardens. Article written by Debbie Green, Extension Master Gardener Volunteer.